This 13ft Replacement Trampoline Padding is suitable for our 13ft trampoline (Ref: 155116), sold separately. We know that your trampoline is going to be very popular and will get an enormous amount of use. Over time, this can lead to certain parts developing signs of wear. If, after years of fun, you need to replace your trampoline padding, this 13ft Replacement Trampoline Padding will fit your trampoline perfectly. Trampoline padding is crucial to protecting users from bruises and scrapes, and at 20mm thick, our 13ft Replacement Trampoline padding will make sure that every trampoline user stays safe. Trampoline padding covers the springs and steel top rail with a durable cushion to ensure that trampoline users don’t feel the trampoline frame or springs underneath. Our weather proof padding is made from water resistant PVC material, specifically designed to survive the outdoors. This helps to protect against mildew and prevents the padding from losing its shape, so your Replacement Tampoline Padding will be just as durable as the padding it replaces. 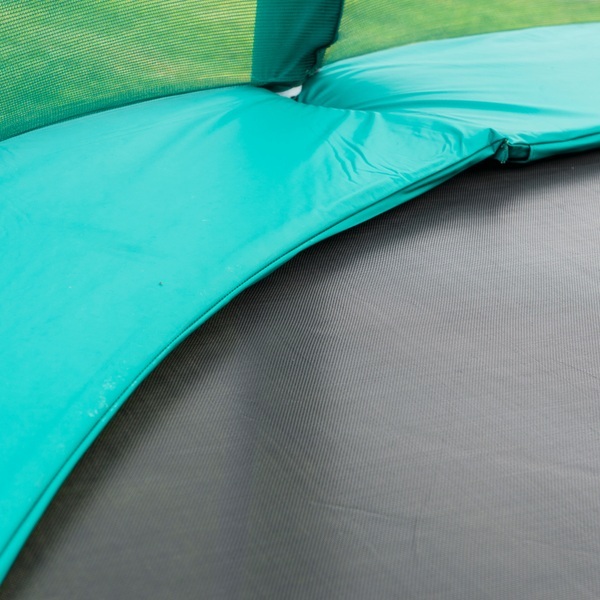 The size and shape of this replacement trampoline padding are designed to fit our 13ft trampoline (Ref: 155116), sold separately, with cheerful green material to match the colouring of the enclosure.